EDMOND, Okla. — A prominent professing atheist group recently wrote to officials in an Oklahoma city to request that an ordinance outlawing the distribution of literature profanely mocking Christianity—to the point that it causes a public disturbance—be scrubbed from the books. The Wisconsin-based Freedom From Religion Foundation (FFRF) contacted the attorney for Edmond, Oklahoma on Tuesday to advise that an unidentified concerned citizen alerted the organization about the ordinance, which it contends is unconstitutional. The ordinance at issue is under the “Public Peace and Safety” section, which prohibits speech and behavior that results in a breach of the peace. 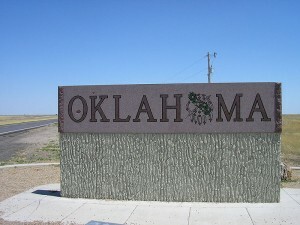 “It shall be unlawful and an offense for any person to circulate any literature or use any language within the corporate limits of the City of Edmond, that casts profane ridicule on God, Jesus, or Christianity, which in its common acceptance is calculated to cause a breach of the peace or an assault,” the ordinance states. Other laws under the section prohibit displaying inflammatory signs that would cause a breach of the peace, disturbing religious worship services with “rude, indecent or improper behavior” or generally using “obscene, offensive or abusive language” on the streets in a manner that causes a public uproar. FFRF believes that the blasphemy law protects Christianity more than other religions, or atheism, and violates the First Amendment’s right to freedom of speech. FFRF therefore is asking that the law be struck from the books. 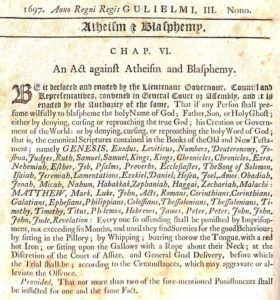 The Massachusetts Bay Colony’s law prohibiting blasphemy. As previously reported, a number of states and municipalities have passed blasphemy laws throughout history, with Massachusetts’ prohibition believed to be modeled after a statute enacted during the days of the Puritans, who left England for America to worship and serve the Lord in purity. “Whoever willfully blasphemes the holy name of God by denying, cursing or contumeliously reproaching God, His creation, government or final judging of the world, or by cursing or contumeliously reproaching Jesus Christ or the Holy Ghost, or by cursing or contumeliously reproaching or exposing to contempt and ridicule, the holy word of God contained in the holy scriptures shall be punished by imprisonment in jail for not more than one year or by a fine of not more than three hundred dollars, and may also be bound to good behavior,” the law reads. Michigan, Oklahoma, South Carolina and Wyoming all prohibit blasphemy as well. Similarly, in 1775, General George Washington signed an order that prohibited profanity among the U.S. military, and many state governors followed suit. “The general is sorry to be informed that the foolish and wicked practice of profane cursing and swearing, a vice hitherto little known in our American army, is growing into fashion. He hopes that the officers will, by example as well as influence, endeavor to check it and that both they and the men will reflect that we can little hope of the blessing of Heaven on our army if we insult it by our impiety and folly. Added to this it is a vice so mean and low without any temptation that every man of sense and character detests and despises it,” he wrote.